In this episode, Todd Brown and Robert Peake talk about how GTD can help you manage your personal and professional relationships clearly and effectively. 00:06 Robert Peake: Welcome everyone to another Change Your Game with GTD Podcast. My name is Robert Peake, I’m here with Todd Brown. 00:13 Todd Brown: Hello, Robert. 00:13 RP: Hi Todd. And in this podcast series, our goal is to help you learn how to get a little more done with a little less stress, provide some tips, practical advice, things that we found work for ourselves and our many, many clients that we’ve worked with, particularly around this methodology called “Getting Things Done”, GTD which has just helped a lot of people around the world to… Sort of do things with a bit less friction, a bit more ease and fundamentally to get things off of your mind. You can be present, you can be focused. That’s the goal, if that sounds interesting, stick around, that’s what we’ll be talking about. 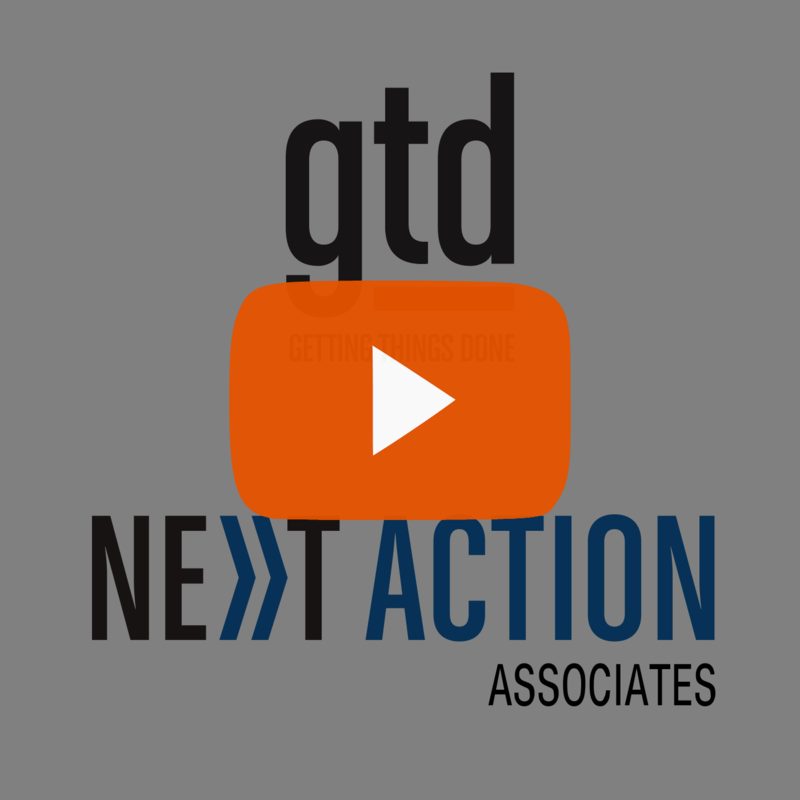 00:56 RP: And in particular for this episode, we were talking just a little bit before we we went live with the video about how GTD can help when you’re in a management position of any kind. So very, very broadly, to help you manage others, right? So we think of this as a personal productivity methodology, and it is. But it can really help when… The boundary for getting things done, isn’t… Doesn’t just begin and end with you as well. So we wanted to explore some of that, we wanted to talk a little bit about how GTD can help you manage others. Todd, I think you and I have both been in various types of leadership positions and also really we’re saying, “Anyone that has a cat has management [laughter] to do.” In all various kinds of relationships, there are things to manage. What are some of the things that you’ve found, most helpful about the methodology or about the thought process of GTD as it relates to effective leadership and managing others? 02:09 TB: Yeah, I think one of the most important points, it’s just riffing on something you’ve already mentioned is the acknowledgement really, that as you become a manager, managers in general, get things done through other people, right? And sort of that acknowledgment is important. I think as you implied earlier, GTD… A lot of people think about it as, “Hey this is about making me more productive. But if you’re a manager, GTD also helps you to make sure that you’re getting, yes, the most return on your time, but also that you’re managing the relationships that you have with the people that you manage, appropriately, right? So, one very practical example is this idea of the Waiting For list. So we have a… As a manager, I’m asking people who work for me to handle various issues, some strategic, some quite tactical and many managers, I would say most managers, the majority of managers don’t do a great job then, of having delegated those things, of keeping track of what they’ve delegated. When did they delegate them? Does this person have a… Does this person have a clear sense of what they’re delivering for me? Right? 03:24 TB: And the proper creation and maintenance of Waiting For reminders, I think can be a big upgrade for an awful lot of people. Just one thing about that, again, for those that aren’t maybe familiar, a good Waiting For will indicate who I’m waiting for, what I’m waiting for, and when I started waiting. That sounds pretty commonsensical. But the middle one of those three, right? What I’m Waiting For? Just the codification of that, just agreeing that with the person who works for me, can be hugely beneficial. I think… You know, a lot of people in my experience, and again, as a manager for a lot of years and I used to do this too, I would delegate things by basically just an email would come in, and I’d think, “Well this person should go handle that and I’d sort of forward it on and say something like, over to you, right? 04:16 TB: Now, in some cases it was something incredibly tactical, that was probably an appropriate way to deal with it, but to the extent that what I had forwarded on, was more, was more ambiguous, was more sort of yeah not really clear how to take this forward, that wasn’t a very helpful way to delegate. Coming up with a conversation… Or coming up with an agreement rather with the person I was delegating to, what exactly are you gonna be providing back? Would have been much more helpful. So again, it’s just, I think for me, a great reminder that some of these things which seem on the surface to be fairly straight forward and self-explanatory can make a huge difference if they’re implemented consistently. 04:56 RP: Yeah, yeah, no creating that clarity, I think it almost forces that clarity to some extent. When you realize I’m gonna be putting this on a list and I’m gonna be reviewing it again later for appropriate follow-up, and I need to know what it is, right? [chuckle] Sorted out the thing is pretty squishy as you said, as you said, over to you or handle this. Whereas being able to see, “Have I gotten what I needed back? Can I take this off? In order to do that, you have to create a clarity for yourself, and automatically you’re creating that clarity, for that other person. Which I think is really, really important. In fact, I think one of the fundamental skills of managing in any management relationship is creating clarity for those around you about where we’re headed. That is leadership, it’s, here we’re going and here’s how’s we’re gonna get there. 05:51 RP: Yeah, great stuff. It reminds me too, of another really key list that I found helped me when the Waiting Fors, in and of themselves, weren’t quite enough. And I think some people get to this point where they go, ” Oh my gosh, I have so many people under me, so much going on, a Waiting For is getting really, really huge.” That’s a point at which, another potentially useful list can come into play called The Projects Delegated list. So for me, this was when I moved from just having a small-sized IT department, to also having responsibilities across other departments at a more kind of executive level. I realized just recording the tactical back and forth wasn’t enough. I was delegating some pretty big projects with complex multiple steps and I really just needed to track it at the outcome level. I really just needed to know this is what they’re going toward. And here are some basic standards of how I would like to get them to get there which I obviously would communicate to them. 07:54 TB: Sorry, I thought you were gonna say any difference in what it was like to work with people who practiced GTD versus not. [laughter] How much time do we have again? 08:03 RP: That’s a resounding yes. But any difference in how you relate to managing people that kinda know the game in relation to GTD and the parlances that have their own lists set up, versus not? They have maybe their own system or no system. 08:19 TB: Yeah, it’s… How would I put it? If I know that the person that I’m talking to already knows the vocabulary, knows the core ideas. Then the barriers to productivity have been reduced tremendously. And this is, of course, this is one of the reasons that we find organizations that have implemented GTD. Things just happen in ways, in much more friction free ways. So, yes, I’d say that my own, as I think about it, my own practice doesn’t change in the sense that I’m still looking and dealing with someone who knows very little about GTD or nothing about GTD. I’m still trying to agree outcomes, I’m still trying to make sure that we’re both clear, what’s the commitment that we have between us. 09:05 TB: That doesn’t change, but I’m going to need to spend more time probably explaining and it’s going to take longer to get there. And of course I’m going to have less confidence that the person that doesn’t know GTD is going to be maintaining the information in a helpful way for them, right. So, I’ll be gently encouraging [chuckle] things like are they capturing appropriately, have they just made a note of the fact that they’ve agreed to do something for me. These kinds of things do pop up. So yeah, my… I’d say that the core ideas behind the practice don’t change so much, but the way that I interact with the person needs to accommodate the fact that they’re gonna be new to it. And so I’ll be gently encouraging them in the direction of GTD best practice. Even if I know that they don’t really use GTD. 09:58 TB: In both of our interest, right. That’s not just about me being selfish about the way I wanna work. Let’s be clear, what is our commitment to each other, are we both agreed what the outcome looks like? I love your example of the Projects Delegated list, by the way, because that’s in some ways, it’s an elevated, it’s an elevated Waiting For list, is what that really is, right? It’s a Waiting For list at 10,000 feet or at Horizon… One in the horizons of focus model. And I’m with you completely. Some people choose to keep those on their standard Waiting For list. Especially if the volume isn’t all that high, but I think it’s an interesting… As a manager, it can be an interesting acknowledgement of the complexity of something. 10:42 TB: If you recognize that you’d need to track it as an outcome and not as an individual next action or as a standard Waiting For. I think I’ve seen that a lot and it can help managers who tend toward micromanagement. If someone’s got a tendency to micromanage, encouraging that manager to say, “Look, this person as far as I can tell is competent, can do their jobs properly. Why are you tracking the fact that they’re making a particular phone call, and you’re waiting for the results to that or they’re gonna be sending an email or something? Why aren’t you tracking this at a higher level? And I’ve seen that pretty dramatically change the way that managers interact with their people. Again, having the confidence that what I’ve done here has delegated an outcome, not delegated an action, and that can be a real game changer. 11:38 RP: Yeah, yeah, Certainly, certainly found that as well. As I’m reflecting on what you’re talking about in terms of creating clarity and agreements between people. I realize people, particularly the ones that don’t do GTD, don’t always keep their agreements. So, I know I’ve had the experience of the use of the GTD methodology has helped me as a manager to be more objective, and more effective as well in both managing up, and managing out, meaning, making the case as it were for pay rises and promotions, and also making the case that this person really isn’t up to this job, not because I don’t like them, not because [chuckle] I don’t… That some feeling or belief, but because actually I have a list of Waiting Fors that we followed up on multiple times. I have information about projects delegated that haven’t gotten done. 12:39 RP: And on the converse, I have some record and some objective external way of evaluating. Yes, this person really is on top of things, this is a very capable pair of hands in the organization. This person really deserves to be rewarded for that. So I don’t know if you found that too, if it’s a side effect, or if it’s a positive side benefit of GTD in a way, but certainly for me it’s helped me feel like a more objective manager, in those manager relationships to have external systems that are helping me, helping me gauge what’s the turn around time? How’s this stuff coming back to me? Is it being done to a standard where I can really tick it off, or they say it’s done and I go, “Well, actually it’s not quite done to the level we need it done”. I don’t know what your experience is with that, but that was certainly something that showed up for me as a very positive side effect of the process. 13:45 TB: Do you know, what it brings up for me is this idea that commitments, it’s such an interesting idea, this idea of commitments, and in some ways, as I say, it’s the atoms of GTD, it’s in its most fundamental level, it’s about commitments, what are our commitments? And I think you’re right, I think I’m really surprised a lot of how cavalierly people treat commitments, and it’s in some ways you can sort of understand it, because people are so overwhelmed, there’s so much coming at ’em, and they’ve got so much to do, and they feel always busy, and they can’t relax, and they can’t focus on… They can’t shut off from work, they can’t focus on that nice meal they’re having with their friends, or their family or whatever. And so they’re selective in what they choose to focus on. I once had… It just occurs to me, I had a coaching client years ago, who said to me that he treated his email inbox as a news feed. And what he meant by that was all I’m really doing is scanning there, to see if there’s anything that looks like it might even vaguely be interesting. So he wasn’t even really opening every email, which I thought was astounding, that’s a really… And he was a very senior person in a very large global financial institution. 15:05 TB: So it’s quite interesting. I think that it’s… GTD helps us to be consistent, respectful, productive, yes, but it helps us to make sure that we’re handling our commitments appropriately. And I think quite interestingly, it also gives us a gauge for saying, Hey if my world is too big, if the commitments… The level of commitments that are coming at me either from external sources, or from my head, just things that are popping into my mind, that it occurred to me that need to get done. GTD gives us mechanisms for figuring out how doable is all this. Can I really handle the level of commitments that I have agreed to take on. So yeah, I mean I think that’s all really good grist for the mill as I think about managing with GTD. The other thing I wanted to bring up that goes back to something you were saying earlier, had to do with, are we agreed on the vision that we have? And we can talk about that in specific tactical instances when it comes to a particular project, let’s say. 16:17 TB: But it’s also a bigger picture question, where are we as a team? Where we as an organization going? And those conversations… Again, I think are fleetingly rare in many, many of the folks that I talk to. Some organizations do do I think a good job of laying out the broad canvas of, Where are we going as an organization? And I think that in many cases there’s a disconnect between those big strategic goals for the organization, and hey, what does that mean for me as an individual? How do I need to be managing my team differently? How very specifically is what my team is going to do? How does that relate to that big strategic goal I’ve just heard talked about? And that thinking I think is, again, is very helpful when it happens. And I think it’s, again, pretty rare, and I think again organizations could benefit from more focus on those issues too. I don’t know what’s your take? 17:18 RP: No, I think that’s great. I love the idea of commitments as the atoms of the GTD practice. And you’re right, I think commitments happen at a lot of different levels. So there’s, are we committed to the vision? And there’s, are we committed to the very next step and do those things? Join up right? It also occurs to me that in a management position of any kind, you’re in a way co-committed with your team, meaning that by definition, with a manager, the buck stops with you. So people are doing things for you that ultimately, you may not be doing at the line level, but you’re accountable to in some way. So one of the biggest things there is, can you trust your team to execute things to a similar standard as what you have, and what you would hold for yourself, if you were doing it yourself. So to me, that’s one of the big places that GTD for managers comes in, is in that ability to objectively gauge how we’re doing. ‘Cause this is… So you have your commitments that are the “me” commitments and then there’s, in a sense, the “us” commitments. Those can be a lot trickier for a lot of people, if you don’t have any kind of system. It comes down to, well, that’s a good person I can rely on and that’s someone I can’t rely on so much, or whatever. But getting objective about that, and having the mechanics to be able to see and track who’s doing what and to what standard and to what kind of timeline, if time is a factor in all of this. 18:52 RP: For me, it was a huge relief. For me, it was just, “Okay, I can trust the “us,” ’cause I knew I could trust the “me.” That’s what got me into [chuckle] management, ironically, was “I’m a good little individual contributor.” So now the job is help others who are individual contributors and you be responsible for all of that to some extent. It can feel like a weight if you don’t have the systems to be able to track and manage all of that, but once you do, you really can take responsibility for that. And hey, the truth is that responsibility is there whether or not you’re tracking it. That’s the thing is those “us” commitments exist. You’re all in the same boat together, whether you like it or not, once you say “yes” to managing other people. To me, having the system was a real life raft safety net sense that I could trust the “us,” not just at a feeling level, but in terms of the mechanics of knowing that we’d all march in the same direction. 20:01 TB: I love that, and I really like the point you made about the fact that responsibilities are there, whether you acknowledge them or not, or whether you’re conscious of them or not. And it occurs to me, that what is disrupting sleep for an awful lot of people, is the fact that they, that those responsibilities are there and they’re not externalized, and they’re not handled in an appropriate way. They haven’t gone through the, “What is this? What does it mean for me? What’s the next action? What’s the outcome?” The core GTD thinking of the processing, or the clarifying step. And that’s what’s waking an awful lot of people up at night, is this kind of gnawing sense that, “Yeah, I needed to do something about that.” And being woken up in the middle of the night, by thoughts like that, comes from not having handled that appropriately. So yeah, that’s spot on. I know we’re coming to the end of our time. If we were gonna boil this down or sort of top tip approach, maybe with a lens, how about you talk about new managers and I’ll talk about tips for existing managers. How about that? 21:13 RP: Great. Yeah. For new managers, the fundamental thing is you are responsible now for the doers, rather than, the doer yourself. And, in order to be able to be comfortable with that, to the same level you were comfortable with being a capable doer, having all the job skills you needed and so forth, you need good lists. Just very likely, if you’re already a GTD or you’ve been using lists for yourself to know what to do, you need to then take a mindset shift. Take all that same level of responsibility and concern for the organization’s needs, or your own needs if it’s personal, and shift that good level of tracking and appropriate execution to an equally good level of tracking. What have we said we’d agree as a unit? What is the “us” commitment here that we’ve made? Who has it? It’s not me. You’re delegating now. And how can I track that appropriately to support these people, that the team as it were, and making sure this gets done? You don’t have to really let go of any of those fundamental skills. It’s very much a transferable skill, the level of responsibility and concern you’ve had for getting things done. You just need to shift it up into now, we’re getting things done and I’m helping the whole team track and manage and take care of that. How about you, Todd, in terms of more experienced managers, maybe just new to GTD, but experienced in the game of managing others? 22:53 TB: Yeah, I think being able to make clear to the members of your organization, to your direct reports, and to the broader organization, if you’ve got a bigger team. How is what we’re doing as an organization, the commitments that we’ve made to making things happen, our projects, our longer term goals, how does that dovetail with what the organization is doing and what’s important to it, in terms of the ways that it works? That can be an incredibly powerful tool for this phrase “corporate alignment,” absolutely, but also just in terms of engagement. It’s gonna be much easier to get your people to engage, if it’s clear to them how what they do day-to-day, is helping to fulfill the mission of the organization, and therefore, make a positive difference in the world. So, I think that’s one thing that in my travels, I’ve seen a lot of managers have a growth opportunity in. And the other thing I guess I would say is don’t be shy about… Considering… We’ve been talking today an awful lot about outcomes, we’ve been talking about projects, and we’ve been talking about delegating those and keeping track of them. We mentioned the Projects Delegated list. Another important thing to keep track of for yourself and for the people that work for you, are their ongoing responsibilities. 24:23 TB: What are they responsible for maintaining? These are not outcomes per se, they are not things that they’re gonna tick off as done, they’re ongoing things. And, getting a sense… Not just getting a sense, being very explicit about those things for yourself and for your team can help you to figure out how doable is your role, how doable are the roles of the people that you have working for you. Maybe you’ve got someone who’s under-utilized and they just don’t have enough going on. You have a look at their projects, the things that they’re doing, and you have a look at the roles, the ongoing things that they’re doing, and you look at it and you go, “Actually, this person could take on some more, time for a meeting.” So, I think that kind of bigger picture thinking, it’s just one more example of how the methodology helps you to get out of the weeds and raise your sights a bit. And yeah, I think that this can be some valuable thoughts for existing managers. 25:21 RP: Great stuff. So yes, a lot of different levels and horizons at which GTD can help you manage not only yourself but others and hopefully, some real practical approaches that you can take away from today’s session about how to actually do that. So, hopefully, you found this useful. 25:41 RP: Again, this is not just talking about middle management, this is about high level leadership as well. Right? Those responsibilities as well as managing any kind of relationship, personal and professional, where there’s an “us” commitment. It’s not just yours individually, it’s about us moving something forward together. There’s a lot of that. There’s a lot of “us-es”. So hopefully, that’s been useful to you out there. As always, if you have thoughts, questions, topics that you’d like us to potentially address in a later session, info@next-action.eu. Info@next-action.eu is the best way to reach us. So for now, thanks for listening or watching or however you’re being involved with us tuning in today, and from Todd, from me, look forward to seeing you next time. Bye for now.